The coffee was smooth, mild, and delicious and it tasted and looked so wonderful we thought of drinking another cup of Luwak Coffee. But then we remembered we were drinking coffee obtained from coffee beans in the poop of a Civet animal. And there on display for us to see was an Asian Palm Civet and a basket full of Civet poop. How could people drink this coffee, we thought. And then we tried a sample and it was delicious, mild and smooth. Plus, we didn’t get sick or have any medical problems after drinking it. We thought the coffee was delicious. So, we bought one ounce of Luwak/Loewak coffee beans for $17.50 from the Siskio Pranoto family business in Jogyakarta, on the island of Java, in the Republic of Indonesia. 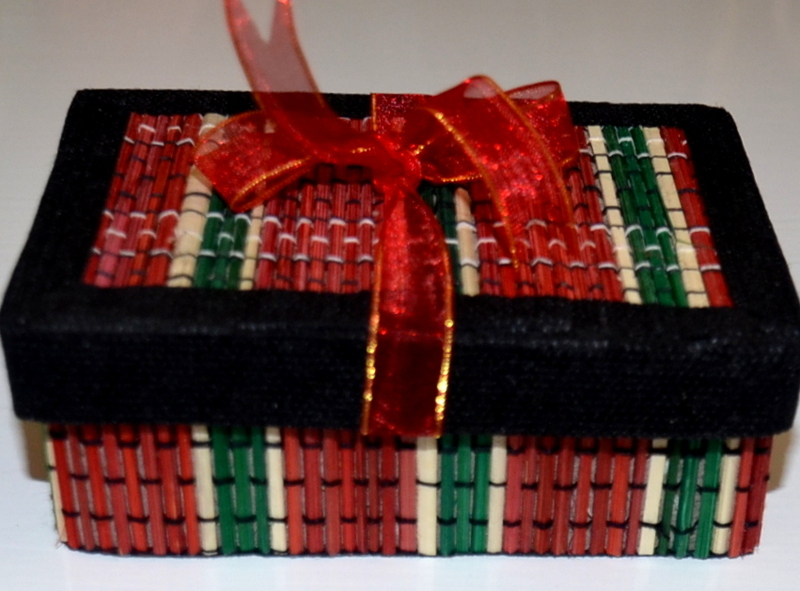 That ounce is packaged in a souvenir box which was perfect for gift giving when we returned home and the beans were good for one year. It is known as the most expensive coffee in the world because of its very limited availability on the international market. 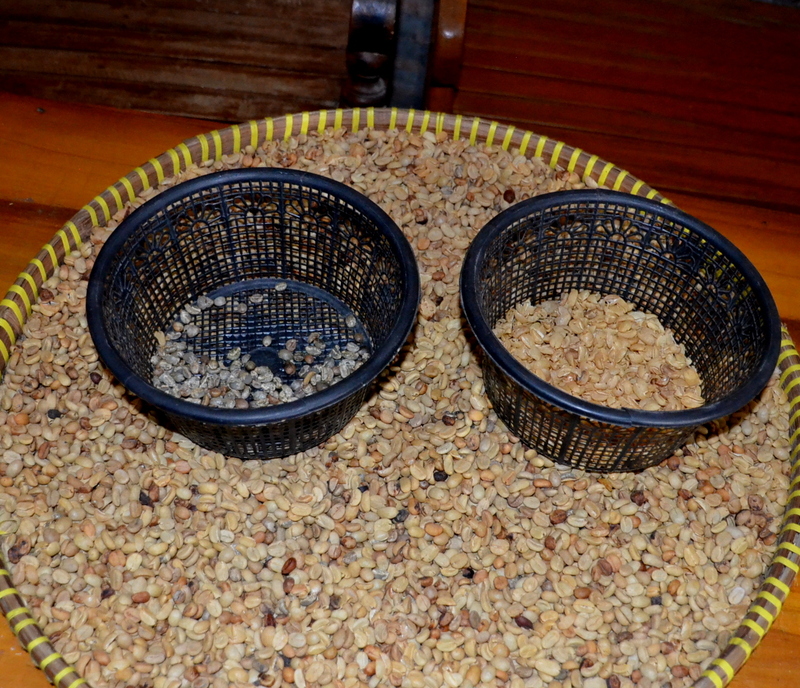 Upon inquiring on how coffee is obtained from the poop of an animal, we learned that it is washed and then the whole coffee beans are collected and washed again even though no bacteria is in the bean. The bean is still intact and in original condition because the civet does not chew the beans. They just swallow them whole to get the fleshy pulp covering the bean. It is while the best, juiciest and ripest coffee beans are proceeding through the Civets digestive track that fermentation occurs and an enzyme in the stomach causes a mild, less acidic and less caffeine product. 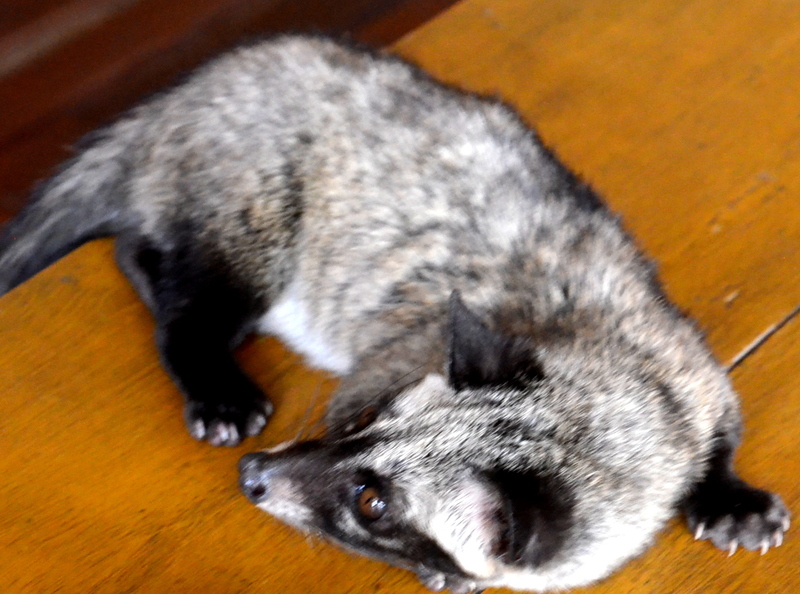 Beginning at age 2, the Civet selects the ripest coffee cherry from the trees and then poops them every 10 hours. Many workers are standing by to collect every piece of poop. “The Civet eats the beans in the evening and we collect the coffee bean poop in the morning,” granddaughter Fina explained. Before the coffee is washed several more times, it is hand peeled of its outer layer, yielding the perfect coffee bean, which is then packaged for sale. This labor intensive hand peeling process is very slow as only one coffee bean at a time is cleaned and peeled. Workers sit round talking and visiting with each other while they peel each coffee bean. 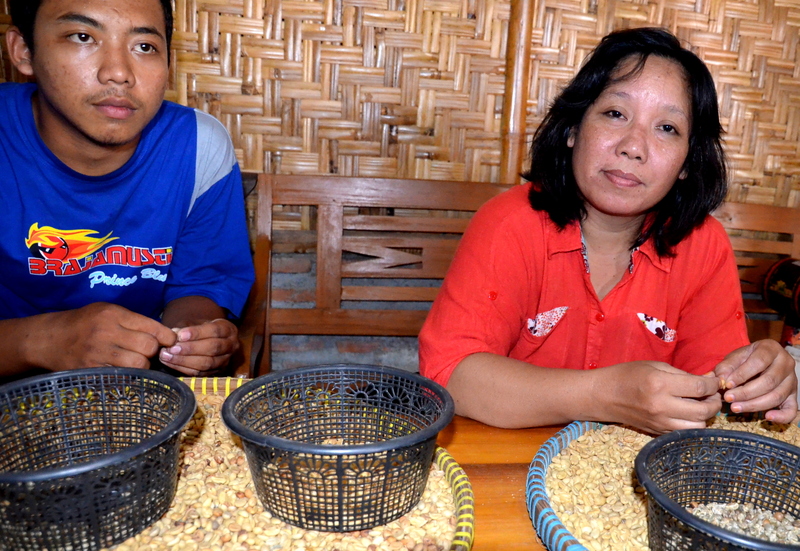 Each person can yield about a pound (1/2 kilo) a day and make about one million Rupiah ($110 USD) a month peeling the beans. 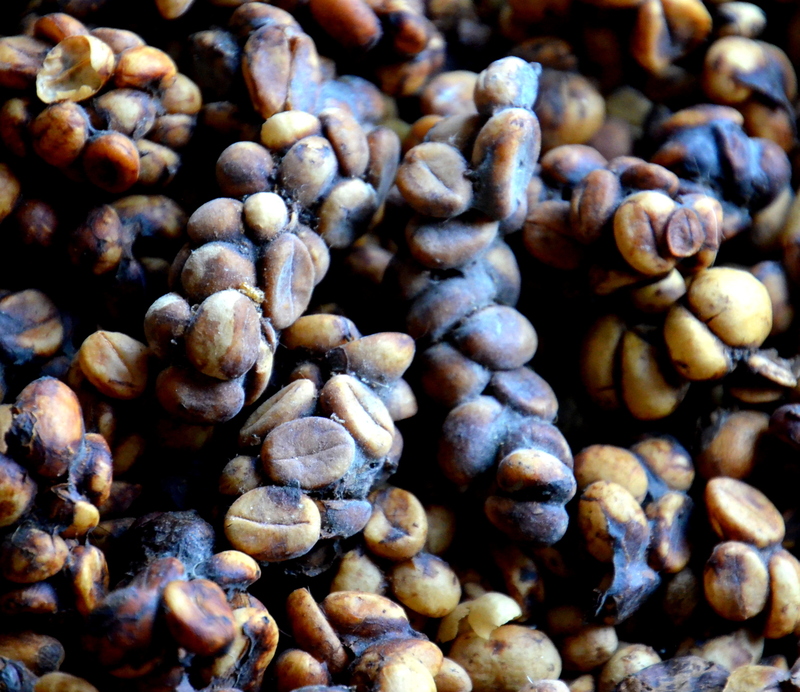 Machines break the beans while removing the outer layer so the beans are only hand peeled at this family-owned business, Kopi Luwak. After the coffee is ready to sell, the Siskio Pranoto family roasts 5 kilos (about 11 pounds) at a time for 2 hours to make sure it is at its freshest and best for sale. Fina and Mary, granddaughters running Kopi Luwak/Loewak. 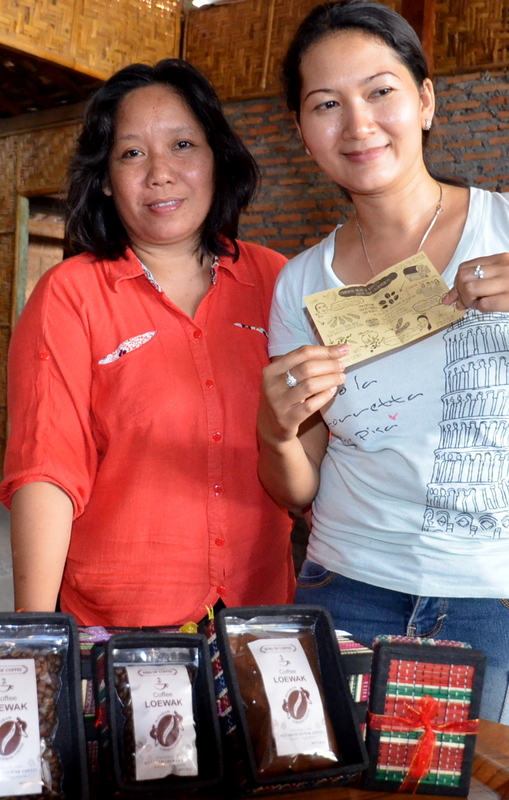 The third generation of the Siskio Pranoto family has owned the business for 8 years now and business continues doing well. Their grandfather started the small 2 hectares (about 5 acres) coffee plantation in 1940 and Civets roamed the property, especially when the coffee cherries were at their ripest. But why would the people want to eat the beans in the coffee poop, we wondered. In the 18th century, the Dutch established coffee plantations in their colony of Indonesia on the islands of Sumatra and Java as a cash crop. The native farmers and workers were prevented from picking the coffee beans for their own use but they wanted to drink coffee. Then it was noticed that the poop of the Civet contained intact coffee beans and the natives took it and cleaned it and made coffee from the beans. The Dutch wondered where the natives and workers were getting coffee. So they told their secret. After tasting the poop coffee, the Dutch liked it better than the bitter coffee from their trees they were drinking. And the natives, workers and Dutch drank the coffee from then on. 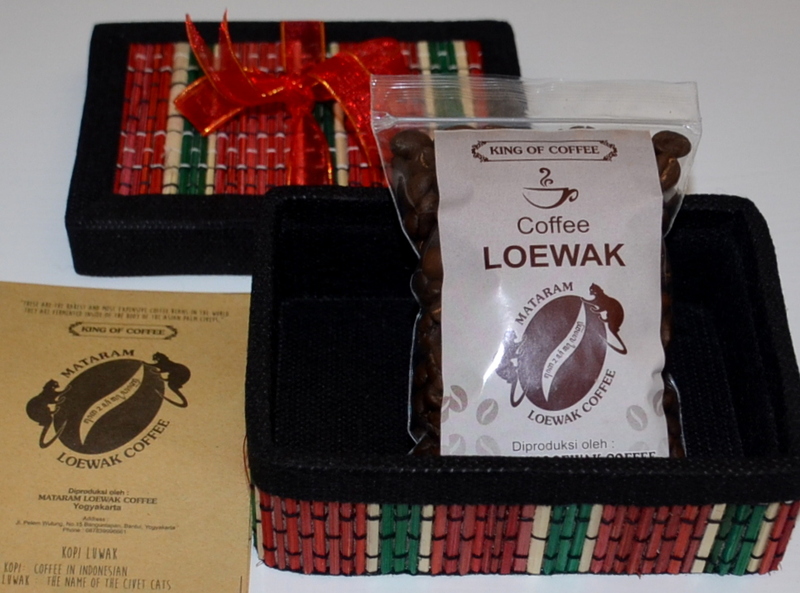 Even people in the Philippines and Viet Nam drink Luwak/Loewak coffee. But, some people think Civet coffee is a scam and cruelty to animals. The coffee industry calls it a gimmick or novelty item. Some people say it tastes just like their favorite coffee or like dish water. 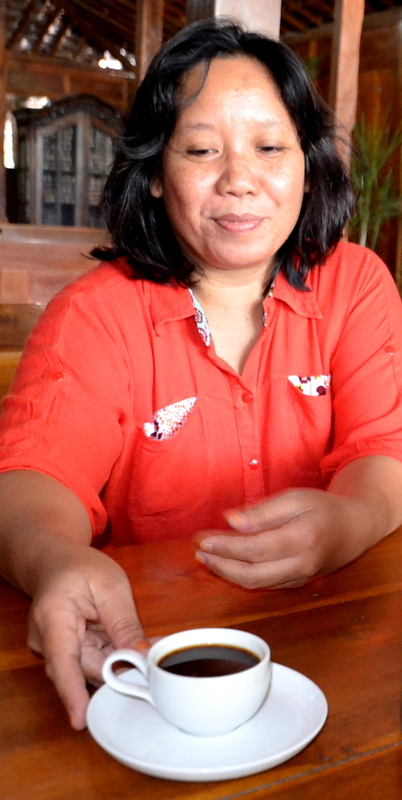 But the Siskio Pranoto family of Java, Indonesia keeps processing and selling the poop beans to coffee lovers who like the smooth, mild delicious taste.